A hammer  is a tool made from a square piece of metal on a (usually wooden) handle. The handle may be long or short. Hammers are used to provide a more forceful blow to an object than would be capable by hands. The weight of the (often) metal head, and the light wooden body, allows for a 'swinging' momentum to assist this. Examples of uses for the hammer include hitting nails, pounding chisels, etc. 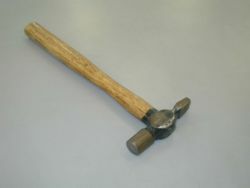 A hammer is one example of a "simple" hand tool that is, nevertheless, not an example of a "simple machine." Although it appears at first glance to be an example of a third-class lever, a hammer will not work without a weighted head. The hammerhead is, in fact, an energy storage device. Kinetic energy is stored in the head over the relatively long time during which the hammer is being swung, then released during the much shorter time when the head strikes the nail. The force applied by the hammer is far higher than the force that is applied if the head simply rests on the nail, and cannot be calculated from lever principles. The hammer is thus one of many relatively simple hand tools that store and release energy through the use of inertia or elasticity. By converting mechanical energy into kinetic energy, it may be considered a force amplifier. The hammer was one part of the symbol of the Soviet Union, the hammer and sickle. Hammers have also appeared in mythology, such as the Norse god of thunder and lighning, Thor. His hammer has a name: Mjolnir. This page was last modified on 11 July 2016, at 19:41.